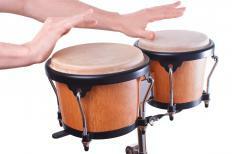 Bongos are considered hand percussion instruments. Hand percussion is a category of musical instruments that includes all percussion instruments that can be carried around or played with a person's hands. Such instruments may be played by a person striking his or her hands against them or by using a smaller instrument to strike a larger one that can be held in the hands. These hand percussion instruments come in many types and can range from primitive stick instruments to ones included in orchestras. Although these instruments allow amateurs to play them without much training, they can be utilized by skilled practitioners to make sophisticated sounds. It is a common impulse among children to make sounds by banging things together with their hands. That is the basic concept behind the types of instruments known as hand percussion. Like other percussion instruments like drums or xylophones, the sounds generally come when someone strikes the instrument in a simple fashion. The distinguishing characteristic of this subcategory is that the instruments are either actually played with the hands to strike them, or they are small enough that they can be held within the hands. For example, a bongo is considered a hand percussion instrument, since the person who plays the instrument strikes the skins on top of the bongos with his or her hands to create the sounds. Maracas, which create sound when they are shaken, also belong to this category. A triangle also belongs to this grouping, even though the instrument contains both the triangle and the small mallet that is used to strike it. One of the fascinating aspects about hand percussion is that an instrument can be created practically from anything that can be held in the hands. For instance, a person that bangs two sticks together is creating a rudimentary percussion instrument. It is important to note however that hand instruments can also be included in complex symphonic works by composers. Many orchestras employ a triangle player for this very reason. People often gravitate toward hand percussion instruments even if they have no musical training. This is because such instruments simply require a good sense of rhythm for them to be played on a basic level. That is why rock bands often give a tambourine to a band member not otherwise employed on a song so that this band member can add to the overall sound. Still, these instruments can also be played at an extremely high skill level by experienced players who can bang out complicated rhythms. What Are the Different Types of Orchestras for Children? How Do I Choose the Best Orchestra Songs? What Are the Different Types of Percussion Instruments? What Are the Best Tips for Buying New Percussion? What Are the Different Types of Percussion Groups?